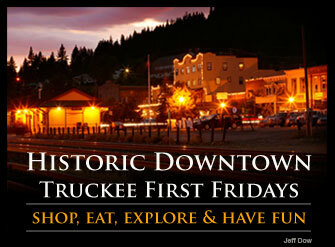 Experience Friday night life at it’s best in Downtown Truckee. Every First Friday of the month, participating downtown shops and restaurants will offer complimentary art, food, drinks, music and more. Participating shops and restaurants will display First Friday Flags so the public will know where the fun is. First Fridays is an event that takes place the first Friday of each calendar month throughout the year from 5 to 8pm in Historic Downtown Truckee Commercial Row. On First Fridays, downtown’s unique shops, boutiques, art studios, salons and eateries will keep their doors open later and offer special promotions, sales, activities, demonstrations, food and beverages and much more! First Fridays is a celebratory community event where locals and visitors alike are encouraged to explore and discover the unique offerings and energy of Historic Downtown Truckee in a festive atmosphere. Look for the First Fridays flags identifying participating businesses.